I thought this pillow was adorable but my friend didn't like the design. Also, the color was off for the room. Dark fuchsia is a hard color to match. This delightful decorative throw pillow from Rizzy Home is the perfect accent for your favorite chair, sofa, or bedding ensemble. A tufted floral design in your choice of vibrant colors lends a touch of texture and style to any living space. can a pillow be too thick? It's very decorative. I really like the texture. I bought mine in grey. I use ot on my bed as accent pillows. Warning: if you use on a chair that you will sit in, you will have to remove them. They are way thick dude! Such a beautiful pillow. But, the color was way off from the picture. The Teal color is more green. I was really disappointed and had to return it. I got the 'cream' color and wish I would have splurged on the purple/pink. It is not a bad pillow - the texture and detail are really nice. Lots of texture, pretty but no shine. I personally desired a bit more “of a dressy “look for my living room. They a beautifully made with vibrant colors (l ordered red). In fact they are so pretty, I ran from to room to try and fit them in my home to no avail. This is really a decorator type pillow but not necessarily practical! However, the color is gorgeous and the design really stands out. Very happy with the purchase. I like the textured look to these pillows. The raised areas are like a felt like material...for some reason when I purchased it I thought the raised areas were of a different material but that wasn't the case. The color is like the color it is in the picture. It does come filled with like a polyester fiber fill. This pillow is gorgeous! Gives the bed some texture. Not the most comfortable pillow to lay on, but we just use it for decoration anyway. I used the orange ones in my guest room to bring out the orange of a multi-colored rug that I have. I have already gotten compliments! I paired these with embroidered pillows to add the perfect touch! They are soft and of very good quality. Very please with decorative pilliow. 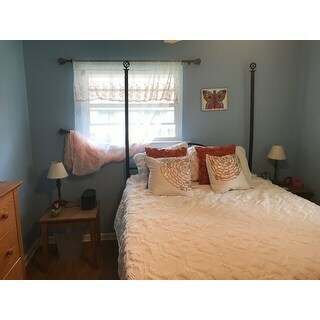 Color was truly a burnt orange which popped when placed with my other pillows. The quality of material exceeded my expectations. Considering purchasing another one! Nice pillow. Not as high a quality fabric as it appears in the picture, but nice nonetheless. 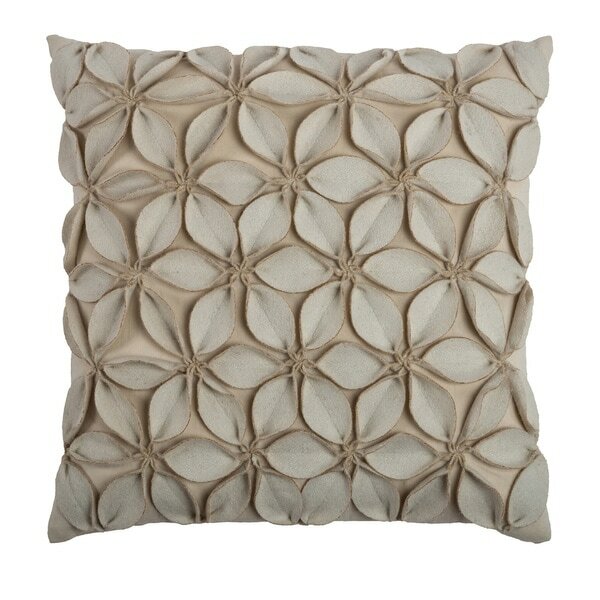 This pillow adds the perfect amount of texture without adding another pattern. It's a nice weight and looks much pricier than what I paid. Love it! I bought the turquoise they are so pretty on my black couch, just love them. I paired them with a white fur pillow, very lovely. This pillow looks different from any I have found in the locally. I was looking for an assortment colors and textiles in pillows for my master bedroom bed. This pillow fills that look! I have the teal one and it's a nice pillow. Still holding its integrity after 3 years. Bought this in orange and it's just the right color for where I'm using it. The cover is removable and looks like I will be able to machine wash but will probably hang dry and then iron. Hours great with my chair! Because I think it will add a touch of class to the nirvana bedding, I love a variety of throw pillows and I'm so excited to get it! "Is this machine washable? In the description, it reads 'Dry Clean Only', and in SPECS it reads 'machine washable'. Which is it?" Hello mpblack3, we do apologize for the confusion, this item is recommended to be dry cleaned. Thank you for shopping with us.